An early start is recommended on the Kullaleden walk from the Kärnan in Helsingborg through the beautiful City Park (Stadsparken) and along the coast to Höganäs. You will catch the soft morning glow on the large ships going through the straits of Öresund. In the beginning, as you walk along Helsingborg’s upper plateau (Landborgen), its old town stretches out below. With views across Öresund to Denmark as a backdrop, the trail weaves its way through well-kept gardens and the beech forest of Pålsjöskog down to the sea just beyond Sofiero Palace. 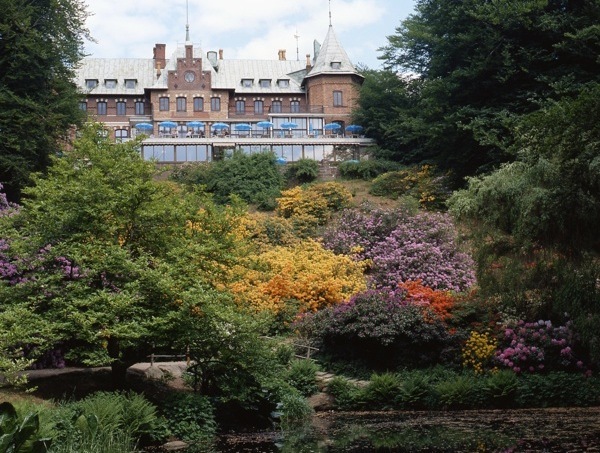 Sofiero Palace was, until the 1970s, a summer residence for Swedish royalty. In 2010, Sofiero was voted Europe’s Best Park. It is truly stunning, especially in the spring when thousands of Rhododendrons are in bloom filling the park with every imaginable colour. There is also a café and a restaurant in the palace as well as a souvenir shop (summer season). (Helsingborg – Sofiero approx 6 kilometers, 1,5-2 hrs to walk). Easy to walk but a lot of stairs while walking through the city parks. Also a short walk on the sandy beach. As you continue through forest and along the sandy beaches the trail opens up and broadens. When you arrive at the first of the many scenic villages dotted along Kullaleden, Hittarp, you will have been walking approximately 2 hours. Most of he villages you pass through with their thatched roof houses, grassy parks and other attractions, add yet another dimension to your coastal wandering. The village Domsten will be halfway to Höganäs and from here there are buses to Helsingborg and Höganäs/Mölle. B&B’s are found in Domsten Viken, Lerberget and hotels in Höganäs. Restaurants that are open all year round in Viken and Höganäs. Time lapse video by Andreas Fernbrant – choose full screen and och HD or 4K! After leaving Domsten harbour the impressive windmill a few kilometers in the distance let’s you know that the well-established and charming village of Viken is not far ahead. From Viken the sight of your final destination, the Kullaberg peninsula comes into clear view and will accompany you the rest of the way. In Viken there are several possibilities for food, either in one of the restaurants in the harbour or at the grocery shop near the bus stop (pass the mill and you will soon see the “food market” Jollen. Continue the coastal path to Höganäs, which is the main town of the municipality. The area around the harbour is a perfect venue for a meal or a swim before you continue towards Mölle. Recommended is also to take a little stroll up to the food market (approx 15-20 minutes from the trail). In Höganäs you will find two hotels and several restaurants that are open all year round. There is also a food market “Lidl” near the town center and bus station. Höganäs is famous for its pottery tradition dated several hundred years ago. You should stay one day extra and have a (self)guided tour and visit the art studios. It is well worth mentioning that from the small village of Lerberget and all the way to Mölle, a twin trail develops that is wheel chair accessible. Most of this trail was built upon the old train track, well known and used in the early 1900’s bringing tourists to Mölle, some all the way from Berlin and then converted to its present form as a cycling trail. There are signs to this separate trail.